Men's Fashion > Trousers > Tag Trouser Collection. Item Description Fabulous looking black colour regular fit codruoy trouser in pure cotton looks smart anytime. Item Description Elegant looking black colour trouser in regular fit having front pleat pattern, great looking formal wear. 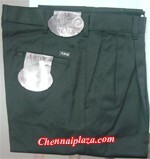 Item Description Smart looking black colour trouser in regular fit having front pleat pattern, great looking formal wear. Item Description Cool looking grey colour trouser in regular fit having front pleat pattern, great looking formal wear.